The Hotel Lliria is located at Lagia 13, Lliria Beach , . It has 9 single rooms, 9 double rooms and 6 junior-suits. The hotel is situated in the highly populated area of the beach, with many restaurants, bars and nightlife venues nearby. 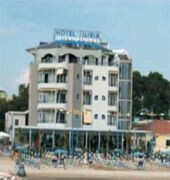 The centre of Durres is a 10-minute drive from the hotel and Kavaja is around 30 minutes away by car.The hotel provides convenient guest rooms.The building is a new construction and offers all the services of a modern hotel, such as 24 accommodation units and a restaurant located on the ground floor.